Capri is an island in the Bay of Naples, close to Sorrento and the Amalfi Coast, that has always been synonymous with beauty, stars, style and impossible glamour. The island is comprised of three main areas: Marina Grande, Capri and Anacapri. The Marina Grande is the main port of the island with easy access to the hydrofoils and near the funicular railway. The town of Capri is the island’s main population center with its designer shops, nightclubs and the famous Piazzetta. Anacapri is situated high up on the slopes of Mount Solaro and is much quieter (and less crowded) than Capri. April, May, September and October are the best months to visit Capri due to the gorgeous weather (warm enough to swim but not unbearably hot) and significantly lower hotel rates. The summer months of June through August are the busiest of the year. August registers the greatest number of tourists on the island, with an average of 20,000 arrivals per day to the 10 square km island…avoid August at all costs. Arrive at Capri by sea! There are daily ferries from Naples and Sorrento to the island and additional ferries departing from Positano, Salerno and Ischia during the summer months. If you are arriving from Rome, be prepared that the journey will take you approximately 3 hours. Take the Leonardo Express from Rome’s Fiumicino airport to the city’s main “Termini” railway station then take the Eurostar Frecccia Rossa (TAV) train to Naples. This is the fastest and most expensive train with tickets costing 40 euros each for the one hour journey from Rome to Naples. Tickets for the intercity train are 20 euros but the trip takes two hours. Once at Naples’ main Piazza Garibaldi railway station, your best option is to take a taxi to the port of Molo Beverello for a fixed rate of 10 euros. The high speed ferries depart from Molo Beverello with single tickets costing 18 euros (40 minutes). The slow ferries depart from Calata di Massa and single tickets cost 13 euros (80 minutes). In my opinion, the hotel Relais Maresca has the perfect sea front location 50 meters from the port with 27 elegant rooms and fantastic views across Marina Grande with Mount Vesuvius in the distance. It has an unbelievable terrace overlooking the marina where they serve complimentary breakfast every morning and exquisitely refined Mediterranean cuisine for lunch and dinner. There are also chaise lounges set up on the terrace for sunning and relaxing. The hotel offers a bathing area situated in a small bay of Marina Grande from early May to late September. The hotel is steps away from the marina where the hydrofoils arrive so you don’t have to travel far or deal with hauling your luggage up to town! Settle in and buy a round trip ticket for the funicular train to take you through the island’s lemon gardens and up to the buzzing Piazzetta, the heart of Capri. The funicular railway is by far the quickest way to travel to the center of Capri from the port. The 3 minute trip departs every 15 minutes and is closed from January through March for maintenance (substituted by bus service). The ticket office is located to the right of the arrival dock and the cost is 1,80 € for a single ticket. Once you reach the Piazzetta, relax with gelato or coffee while you gaze at the sea and the boats. The Piazzetta is a tiny square but always bustling with every seat of the four bars (all open until 2am or so) packed to the rafters. Stroll down Via Camerelle and browse its famous luxury shops and designer fashion boutiques. Continue along Via Tragara until you reach the breathtaking Punta Tragara Belvedere overlook facing the Faraglioni rock formations, Capri’s famous three towering rock formations that jut out of from the Mediterranean just off the island’s coast. The best view of these stacks is actually from the sea and you will have the opportunity to see this on your boat tour tomorrow. Have a drink at La Pergola bar at the Hotel Punta Tragara and enjoy the beautiful panoramic views. For a dip in the sea set against the Faraglioni, take the footpath from the Tragara scenic overlook to the two beaches on the island shore directly opposite the sea stacks: La Fontelina and da Luigi. Afterwards, there is a ferry service that will take you back to Marina Piccola. If you prefer to head back to town, retrace your steps back along Via Tragara but instead of continuing on Via Camerelle, take the road uphill on the right (Via Padre Reginaldo Giuliano) until you come out on Via Fuorlovaldo and Via Le Botteghe. Take the funicular train back down to the marina and get ready for dinner! 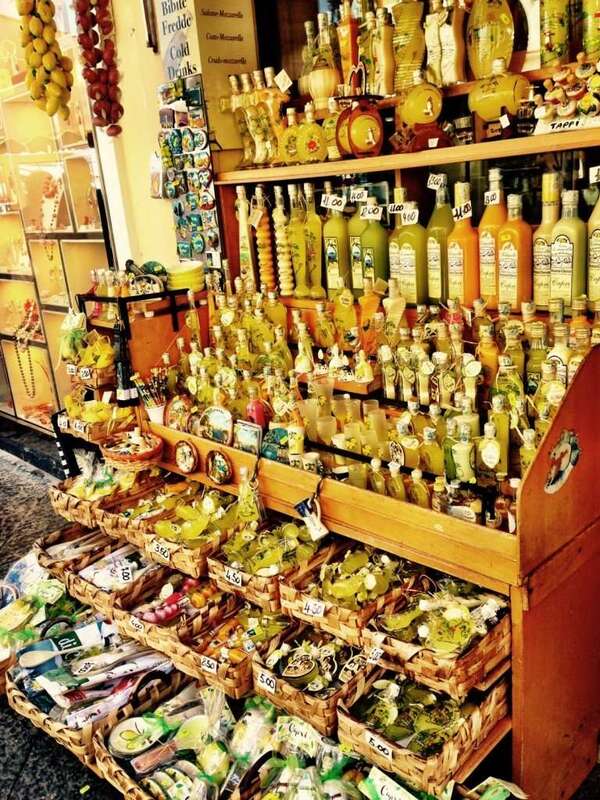 Find limoncello made from the island’s lemons in the Piazzetta to bring home. Situated on the ruins of the Greek walls in the heart of the old town center, Ristorante Buca di Bacco is a great place to eat grilled fish without breaking the bank. The restaurant also has an extensive wine list. Reserve the table next to the panoramic window for a fantastic view and order the famous pizza “sfilatino”! From the Piazzetta, walk through the passageway to Via Longano and you’ll find the restaurant within just a few steps. Open Thursday through Tuesday. From the Marina Grande, board a bus to Anacapri (a 20 minute ride on a minibus). Buses run every 15 to 20 minutes and a single ticket costs 1,80 €. From here, take the chairlift to the summit of Monte Solaro for the most spectacular views of the Bay of Naples and Salerno from 589 meters above sea level. You’ll be able to see the historic center of Capri, the Faraglioni, Mount Tiberus, Punta Campanella and the Sorrentine peninsula. The chairlift takes 12 minutes to reach the summit and costs 10 euros to ride. It runs from 9:30 am to 5:30 pm from March to October and 10:30 am to 3:00 pm from November to February. Enjoy lunch at Il Riccio restaurant, the beachside restaurant of the Capri Palace Hotel on Anacapri, approximately a 20 minute ride from Capri and a 10 minute ride from Anacapri. The restaurant is right near the Blue Grotto with a homey picturesque atmosphere and breathtaking views over the sea. The food is exceptional and only the freshest local ingredients are used. 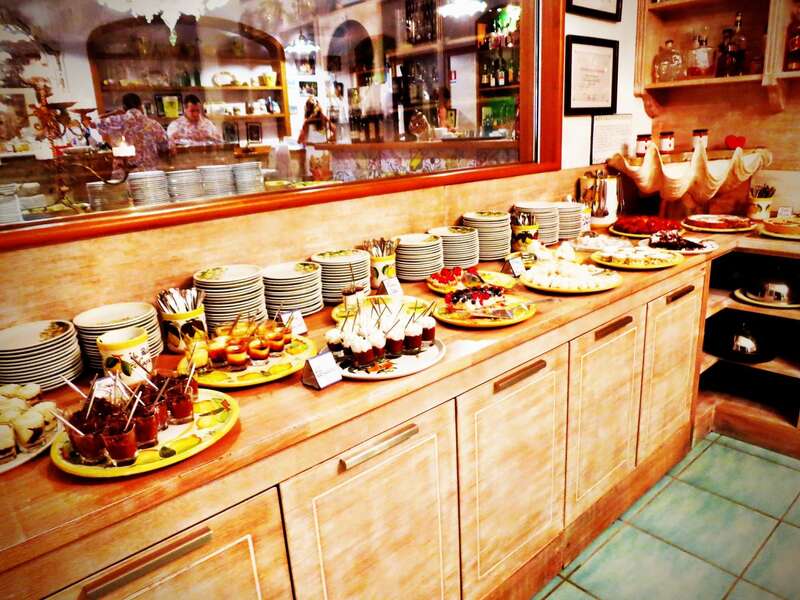 Enjoy the dessert buffet while basking in the gentle sea breeze! You can either ride the chairlift back down or make the 30 minute walk on foot, stopping to visit the hermitage of Cetrella (the site of what was once the writer Compton Mackenzie’s home). Before taking the bus back to Capri, make sure you visit Villa San Michele, the house museum created by the 19th century Swedish writer and physician Axel Munthe, that boasts one of the island’s most panoramic and beautiful views from the terrace. In addition to being a beautiful place full of light, it also houses Munthe’s collection of art, archeological treasures and a sphinx that looks out over the sea. It’s truly a magical place that needs to be experienced! The entrance is 6 euros and is open from 9:00 am until an hour before sunset. Concerts and cultural events are held in the evenings in the chapel or the gardens. Walk through the center of Capri town along a series of scenic lanes with a sweeping view from the Marina Piccola Bay at Via Krupp to the Faraglioni to the Augustus Gardens, panoramic gardens and incredible feat of engineering. The Augustus Gardens are in a historic property adjacent to the Charterhouse of San Giacomo, purchased by the German industrialist Friedrich Alfred Krupp at the beginning of the 1900s to build his residence on Capri. Entry to the Augustus Gardens costs 1 euro from the beginning of April to the beginning of November. The best times to visit are early morning and late afternoon due to fewer crowds. 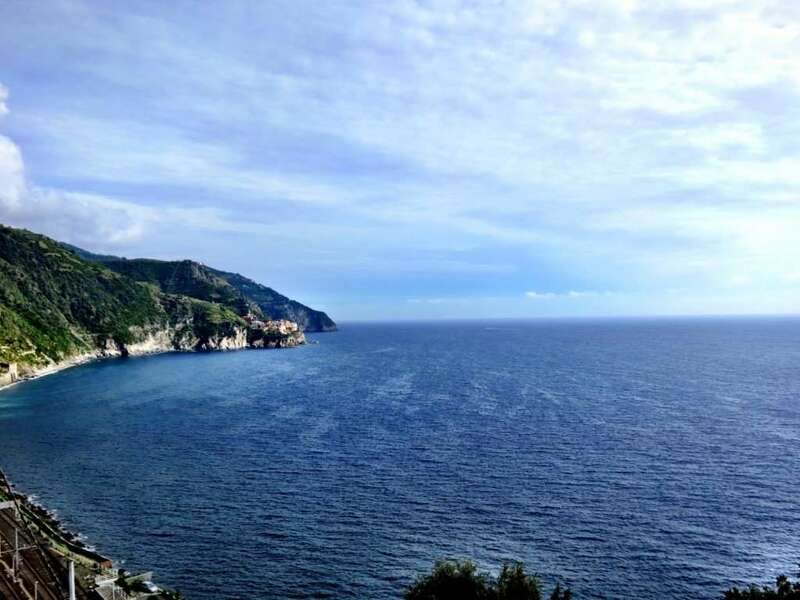 Venture up to Via Krupp, a historic switchback paved footpath connecting the Charterhouse of San Giacomo and the Gardens of Augustus area with Marina Piccolo, for an amazing view of the cliffs and water. Commissioned by Krupp, the path covers an elevation difference of 100 meters. Via Krupp is currently closed due to the danger of falling rocks but can be viewed from above from the scenic overlook in the Augustus Gardens. Be prepared for a dining experience unlike any other! Tucked away in the side streets and alleys above the marina is an enchanting, romantic, fairy tale of a restaurant that is Da Paolino Lemontrees. The tables are nestled under the lemon groves so you feel like you are sitting in your own romantic garden while you dine above the lemon trees. The food is divine and the portions are very generous. The servers bring you complimentary homemade limoncello and it was so good that we bought two bottles to bring home with us. My personal favorite was the complimentary dessert buffet with anything and everything your heart would desire, complete with a gelato bar! If you want to sample the nightlife but don’t want to get caught up in the “touristy” bars of the Piazzetta, check out Quisi, the terrace bar of the Grand Hotel Quisisiana. Anema e Core (“soul and heart”) is the best known club on the island is where you can grab a drink while listening to the band. Panta Rei is a relatively new club that has a restaurant, bar and spa area with pool that was created by owner/architect Massimo Esposito who also designed the newest 5-star Villa Marina hotel on the island. As soon as you wake, head down to the private jetty in Marina Grande, the departure point for boat tours for the Blue Grotto (on the same dock where most of the hydrofoils from the mainland arrive). You’ll want to purchase a ticket for the full circle island tour by sea that will take you to the Blue Grotto and sail you through the arch in the Faraglioni rock formations. The Blue Grotto is a remarkable cave through which sunlight passes through an underwater cavity and shines through the seawater, creating a blue reflection that illuminates the cavern. The cave extends some 50 meters into the cliff at the surface and approximately 150 meters deep with a sandy bottom. Entrance to the grotto is 13 euros. The tour lasts approximately two hours and costs 15 euros. These tours tend to book up quickly so morning is your best bet! You can also hire a private boat which is more expensive but you can stop wherever you want to swim. A coffee served at one of the tables in the Piazzetta costs 4 euros but only 1 euro if you drink it standing at the bar. If you want to take the bus from Capri to Anacapri and the line is too long at the stop in Piazza Vittoria, walk back along Viale De Tommaso and wait for the bus at the previous stop so that you can board the first bus that arrives. 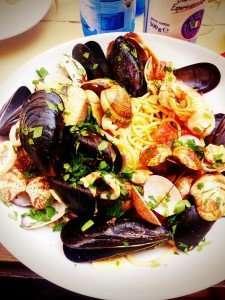 If you want to save money, dine in Anacapri where the eateries are generally less expensive than in Capri. 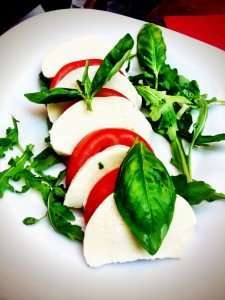 The island is known for its ravioli capresi, insalata caprese, and torta caprese. Be sure to try Capri’s legendary limoncello, a sweet liqueur made with the island’s lemons. The tip is generally included in the price of the meal (especially if you see a cover charge) but some people choose to round the bill up and leave extra. The house wine in Italy is amazing! Simply ask for red or white wine. Significant discounts are often available if you purchase your train tickets in advance online here. Glamorous with its celebrity-packed beaches, lively historic center and breathtakingly gorgeous seascapes and view, Positano is the most sought after destination on the Amalfi Coast and the most photographed fishing village in the world. With Positano’s breathtaking natural beauty, high craggy cliffs and calming sapphire-blue sea, it is truly the jewel of the Amalfi. 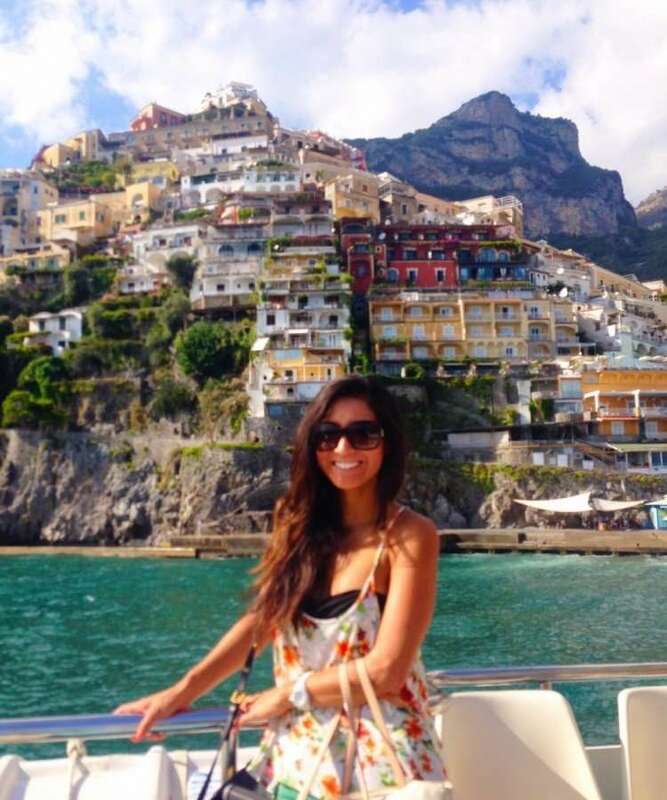 Given Positano’s mild Mediterranean climate of warm summers and mellow winters, there is never a bad time to visit. The best time to visit the Amalfi Coast is from May to June when the flowers are blooming and sun is already warm enough for swimming in the crystal clear waters. The ideal month to travel here is May due to the mild climate, beautiful colors and the absence of crowds. Prices in May to June are lower than in July and August. September to October is also a great time to visit. You can arrive in Positano either by land (train, bus or private transfer) or by sea. Naples, Sorrento and Salerno are the main transportation hubs for the Amalfi Coast. Positano is a 75 minute drive south of Naples. 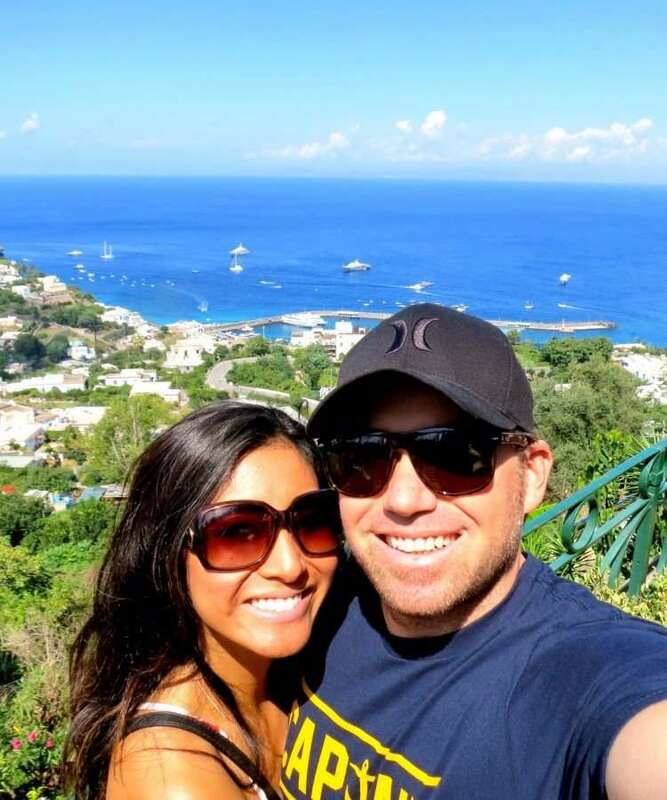 On your drive, you’ll pass Pompeii, Mount Vesuvius, the beautiful town of Sorrento and down the mountain coastline until finally descending to the town. Just a warning, the roads are quite windy with hairpin turns and can get quite crowded during the summer months. If you’re traveling to Positano from Rome, be aware that the journey takes at least four hours. From the Rome Fiumicino Airport, take the Leonardo Express to the city’s main Roma Termini railway station and take the Eurostar Freccia Rossa (TAV) train to Naples. This is the fastest but most expensive train (40 euros) with the journey taking a little more than an hour with trains departing every hour. Train tickets can be purchased in the station at the ticket office or automatic dispensers or online at the Trenitalia website. Significant discounts are often available if you purchase your tickets in advance online here. Once you arrive at Naples Stazione Centrale – Piazza Garibaldi railway station, follow the signs to the Circumvesuviana (the regional railway line situated under the main railway station) and take the one hour train to Sorrento. From Sorrento, take the Sita bus to Positano. Sit on the right hand side of the bus to get the best view on the 30 minute ride to Positano…the road to the Amalfi is a series of stomach churning curves! 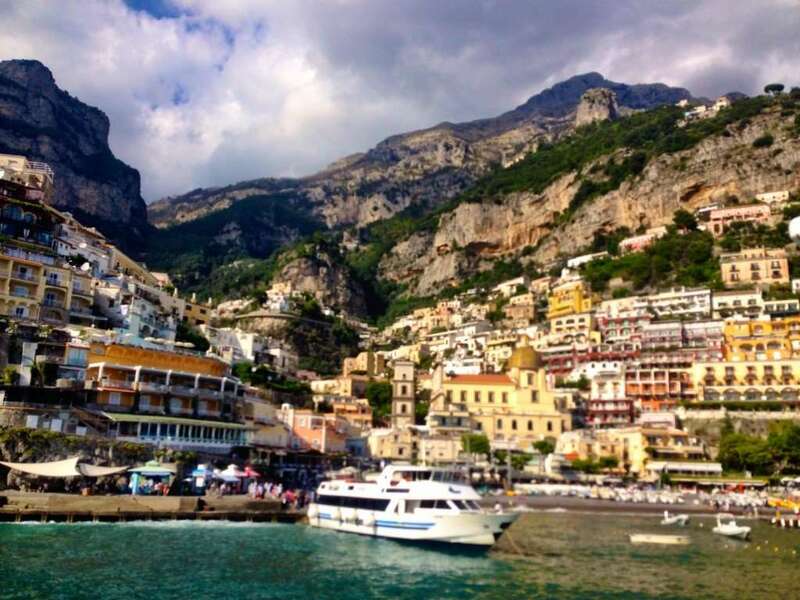 If you are arriving in the summer months, you have the option to take a hydrofoil operated by Metro del Mare from Naples (or Sorrento) to Positano and Amalfi which makes for a beautiful and scenic tour of the coast. Take a taxi (or Alibus) to Molo Beverello port in Naples. The trip takes approximately 40 minutes. 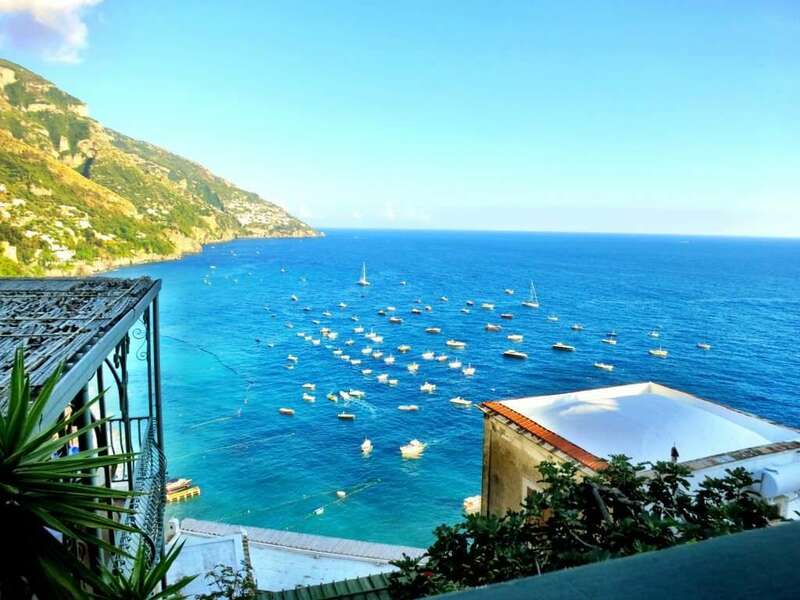 Residence Villa Yiara is an adorable boutique hotel housed in an 18th century building on top of a hill with spectacular balconies overlooking the bay of Positano. Every room features a sea-view terrace and the friendly staff serves you continental breakfast complete with cappuccinos, fresh squeezed orange juice, fruit, pastries and NUTELLA on your balcony every morning! If you don’t mind climbing the stairs that lead straight into town (and it is a climb), you will love this hotel. All rooms, with their charming white and yellow décor, have been recently refurbished and offer free Wi-Fi. This was by far the largest hotel room we stayed in throughout our entire stay in Italy and our stay was an absolute delight. If you’re arriving by sea, hire a porter to take your bags as you walk through the town to the taxi station then taxi up to the hotel. 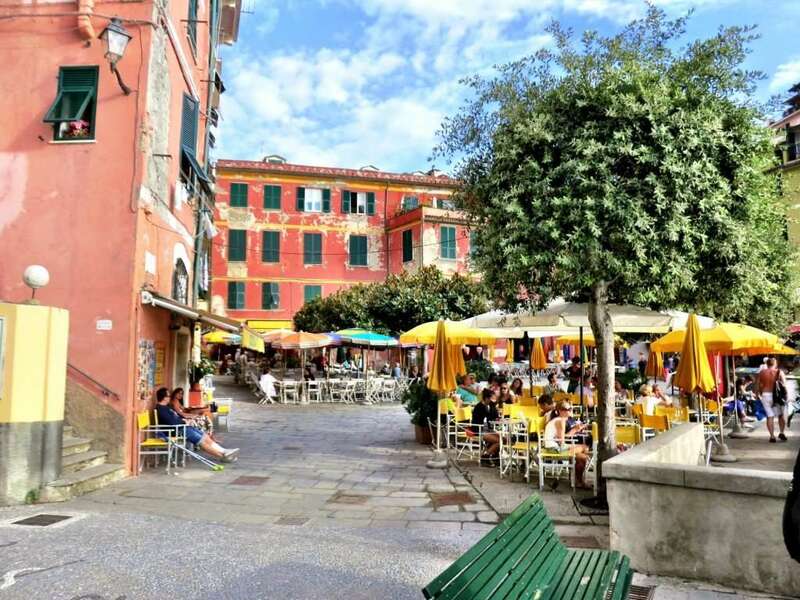 Get settled and stroll into town to explore the central Spiaggia Grande with its boutique shops, restaurants, bars, wine bars and cafes near the marina. Visit the beautiful domed Church of Santa Maria Assunta and its famous Byzantine Madonna painting that dates from the 13th Century, the beautiful Positano Botanical Gardens with panoramic views of the Amalfi Coast, and the Grotta la Porta cave where prehistoric remains have been found. You can also take a ferry to Via Positanesa d’America, a stunning walkway on the cliff. Have a drink at Buca di Bacco Bar, a meeting point for both locals and tourists alike and the clear hotspot of Positano. 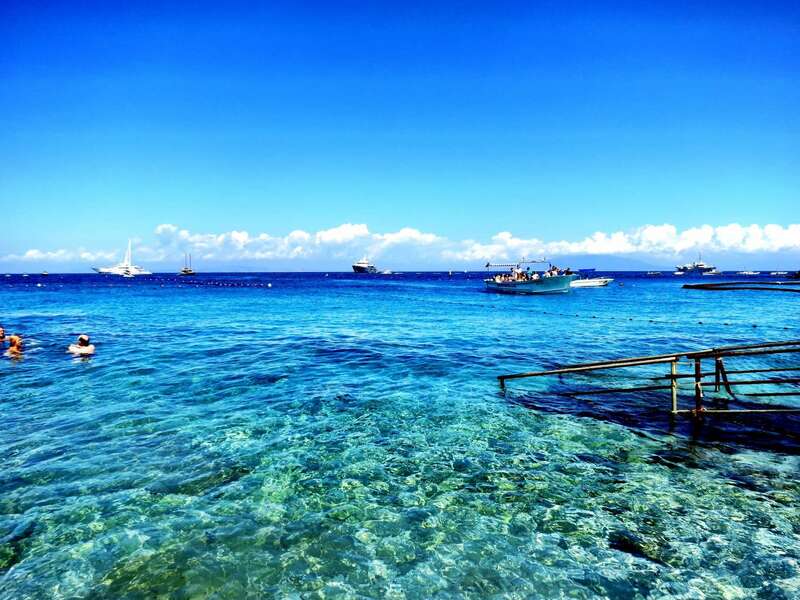 Enjoy panoramic views of the azure waters and mingle with the locals and people from all over the world! Head up the hill for dinner at Ristorante Caffè Positano for an incredibly romantic dinner on a balcony perched on the edge of a cliff. The views from the terrace are absolutely breathtaking and the food is fresh and local. The best part is that the prices are very reasonable for a restaurant with these spectacular views! Our table for the evening! Rise and shine ready to tackle the Sentiero degli Dei (“the God’s Pathway”), a breathtaking and extraordinary panoramic 8 km (3 hour) footpath above the Amalfi Coast. A must-do for any visitor to the Amalfi, the walk from Agerola to Nocelle feels like you are walking through paradise with its stunning views of the coastline and the island of Capri. Begin the walk in Bomerano, a fraction of Agerola. Catch the Sita bus from Amalfi to Agerola and ask the driver to let you off at the Bomerano stop. From here, follow the road signs that lead you to the start of the walk. You will end the walk in Nocelle, a fraction of Positano nestled on the slopes of Monte Peruso. The path is marked by white and red signs with “02” written on them. You will pass the Convent of San Domenic, the Vallone grarelle, caves and terraces dropping from the cliffs to the sea and vineyards before reaching Nocelle. You can then decide whether to make your way downhill by bus or on foot via the 1500 steps that lead to the district of Arienzo. If you descend 300 steps further, you can take a quick dip at Arienzo beach before walking back to the center of Positano. Agerola is famous for its fiordilatte, a particular type of delicious fresh mozzarella cheese. Stop in one of the town’s salumerias before you start the hike and buy some fiordilatte to try with focaccia bread to eat along your walk. If you’d rather have a sit-down meal, have lunch at La Tagliata restaurant which is located 1 km past the village of Nocelle. Eat on one of their three terraces where you can enjoy a fantastic view of the water, Positano, the Galli isles and the island of Capri. The restaurant has organic vegetable gardens on each terrace so you can even select your own produce for them to cook. There is no menu – mama cooks it all for you! If you’re in the mood for a pricey but remarkable experience after your long hike, make a dinner reservation at La Sponda restaurant at Le Sirenuse hotel. A Michelin star restaurant, La Sponda boasts the best view in all of Positano. The spectacular views and unforgettable atmosphere are enhanced by the four hundred candles that are lit at dinner in the restaurant. Enjoy the cuisine inspired by Mediterranean tradition created with only local, fresh ingredients set against the stunning sparkling sea. If you have a wild hair and are looking for some fun on the town, check out the town’s only nightclub Music on the Rocks. The legendary nightclub on the Spiaggia Grande beach is literally built on the rocks and carved out of a waterfront that offers a beach club by day and disco at night. 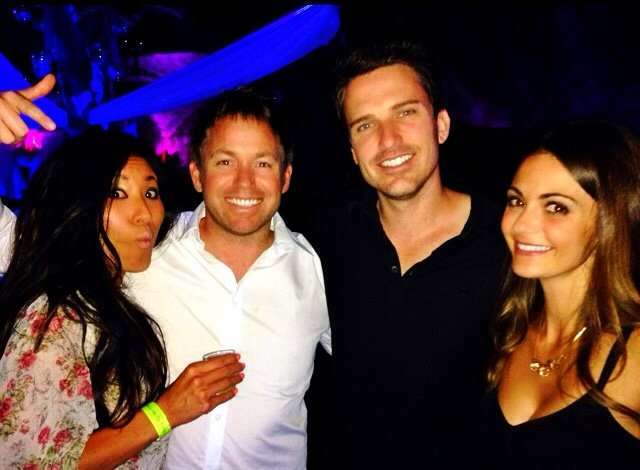 The inside of the club looks like an actual cave with exposed rock walls and ceiling with white columns and illuminated pottery. Rada restaurant sits upstairs, a beautiful but expensive restaurant with gorgeous waterfront views in a posh setting. We dined at Rada then had a fun limoncello-filled night with the pirates at pirate night until the wee hours of the morning! You deserve a beach day today! Spiaggia Grande, Positano’s main beach, is one of the liveliest and most glamorous beaches on the Amalfi coast. Lined with a string of bustling restaurants and bars, the three hundred meter long beach has two bathing establishment and a free area. My personal preference and favorite beach in all of Positano is Fornillo Beach. Fornillo Beach is accessible from the center of town via a short and lovely walk between the sea and the cliffs. It is close enough to town so it’s not difficult to get to yet far enough that is much more peaceful with cleaner water than Marina Grande. Laurito beach is a small little beach that can be reached via a flight of stairs that starts in the small square opposite Hotel San Pietro. Laurito has two casual restaurants, a free beach and a private beach that belongs to a small hotel. The beach gets its name from the many laurels growing in the area and is beautiful as well! Arienzo beach, or 300 steps beach because of the impressive number of steps you need to climb down to reach it, faces the south west so it enjoys the sun longer than any beach in Positano. The beach consists of private and free areas. On your way down to the beach, you’ll be able to see some of the most luxurious villas on the Amalfi Coast, including one that once belonged to Franco Zeffirelli! Sita buses and buses operated by the Flavio Gioia Coach company stop at both Laurito and Arienzo beaches and depart from the center of Positano. A shuttle boat service is available from both Positano and Praiano to the beaches. Have lunch at Lo Guarracino restaurant with its breeze-kissed shaded terrace draped in bougainvillea, gorgeous views of the water and the freshest seafood that is located along the seaside path that leads you to Fornillo Beach. The seaside path starts near Covo Dei Sarceni Hotel at the town dock. Walk 10 minutes down the path until you see the restaurant to your right. 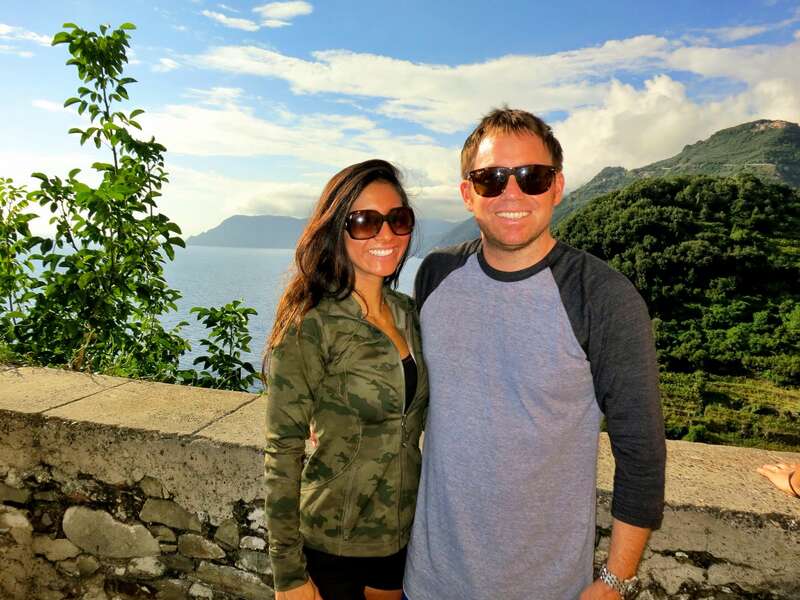 If you have the time, I highly recommend day trips to Ravello and Pompeii. Ravello is situated in a more elevated position than the other pearls of the Amalfi Coast and boasts the most picturesque and exceptional views of the coast from its marvelous villas and gardens. Don’t miss Villa Rufolo, famed for its beautiful cascading gardens and divine panoramic views, a villa built in the 13th century for the wealthy Rufolo dynasty. You can hire a private driver or take the Sita bus to Ravello. Pompeii was an ancient Roman town-city that was destroyed and buried under 13 to 20 feet of ash and pumice in the eruption of Mount Vesuvius in 79 AD. The objects that lay beneath the city have been well-preserved for centuries due to the lack of air and moisture, providing a detailed insight into the life of a city during the time. During the excavation, plaster was used to fill the crevices in the ash layers that once held human bodies so you can actually see the exact position the person was in when he/she died. Take a ferry, bus or taxi to Sorrento. From Sorrento, you can take the Circumvesuviana train to the Pompeii Scavi station. Some people actually now prefer visiting Herculanium which is smaller than Pompeii (take the Circumvesuviana train in Sorrento to the Eculano station). Herculaneum has not been fully excavated and some consider it better preserved. If you have the time, visit both! Sit on the right hand side of the bus to get the best view on the 30 minute ride to Positano from Naples…the road to the Amalfi is a series of stomach churning curves so be prepared! If you visit Positano during the summer, the Feast of the Assumption (feast that centers around the famous Madonna icon) is held on the 15th of August and is an important event for the city! 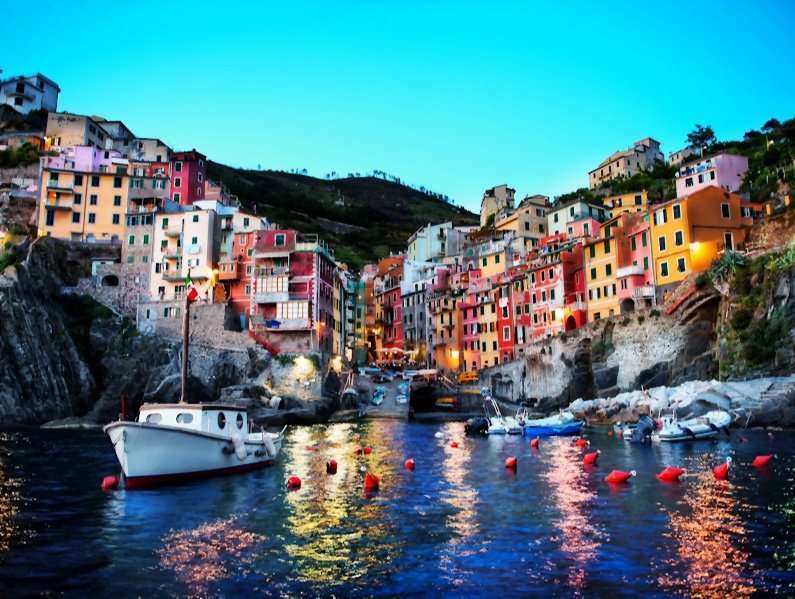 The Cinque Terre is made up of five main fishing villages – Monterosso al Mare, Vernazza, Corniglia, Manarola and Riomaggiore (from north to south). The villages are set against some of the most beautiful and dramatic coastal scenery in the world with its steeply terraced cliffs. The best way to travel between the villages is by train as the travel time between each village is mere minutes. If you prefer to take on the 12 km hike through all five villages, start at one end and then take the train back to your starting point! I prefer to stay/start the hike in Monterosso al Mare and take the train back from Riomaggiore. The nearby villages of Levanto and Portovenere aren’t technically part of the Cinque Terre but are breathtaking and worth checking out if you have the time. 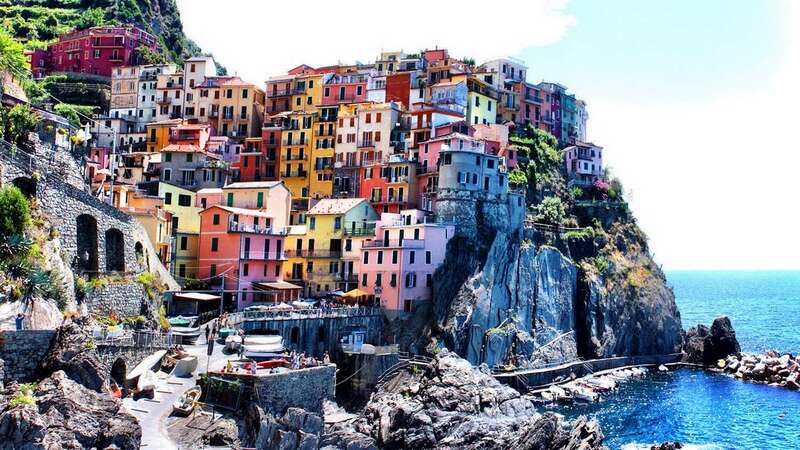 The ideal time to visit the Cinque Terre is mid-May to mid-September. If you want to hike, the ideal season is mid-March to mid-October. Some of the hiking trails may not be accessible due to heavy rainfall in winter and fall. Cinque Terre is famous for the biggest Presepe in the world in the winter (located in the Manarola). Avoid traveling here at all costs in August which is peak season…you’ll end up paying three times as much! The best airports to fly into are Pisa (easiest), Genoa or Milan. Monterosso is approximately 1.5 hours from Genoa and La Spezia is the closest city of any. La Spezia station is the main transport hub and you can reach any Cinque Terre town via train from there. It takes approximately 10 minutes to get from La Spezia to Riomaggiore and less than 5 minutes in between each town. The trains generally run once an hour and the train tickets are cheap (Vernazza to Corniglia costs €1.80). Make sure you validate your train ticket at one of the small yellow machines located on the train platform to time stamp your ticket and avoid a hefty fine! Private vehicles are not allowed beyond village entrances so if you’re arriving by car, you may need to pay to park in designated car parks (€2.30 per hour or €19 per 24 hours) then hike 1 km or more to the villages or take the minibus shuttles (if offered in your village). From late March to October, daily shuttle boats run between all of the Cinque Terre villages with the exception of Corniglia (€16 one way including all stops, €21 return on weekdays and €23 on weekends). This is a fabulous way to see the coastline and view each town entering from the sea! Monterosso al Mare is the northernmost village and the largest of the five villages so most of the larger hotels are located here. You’ll find an old town, a new town, a nice sandy beach and a long seaside promenade. The La Spiaggia Hotel is a family run hotel right on the beach in Monterosso al Mare. Like all hotel rooms in Italy, the rooms are small but you can’t beat the location. 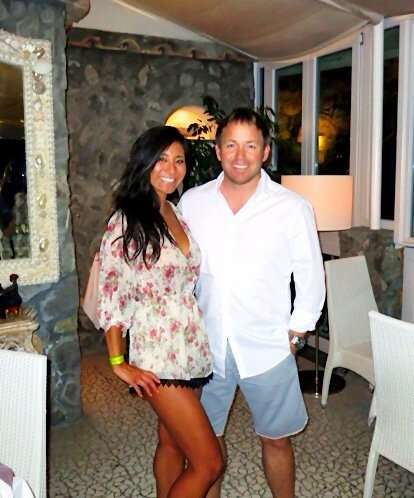 The owner, Andrea Poggi, has quite an interesting personality…you may love him or hate him. The hotel is steps from the train station and offers free parking at the property. Get off the train at Monterosso al Mare, turn right and walk for 1 minute past the restaurants and cafes. As soon as you step off the train in Monterosso al Mare, you’ll immediately find yourself on the Ligurian seafront of the Fegina promenade. Monterosso is divided into the old town and the new town by a single tunnel used by pedestrians and the few cars that are in town. You’ll find a free small pebble beach right in front of the train station with beach resorts to the right and the left (the only beach resorts of the Cinque Terre). Monterosso’s sandy beach is also the biggest of the Cinque Terre so if you’re a beach lover, you will love it here. 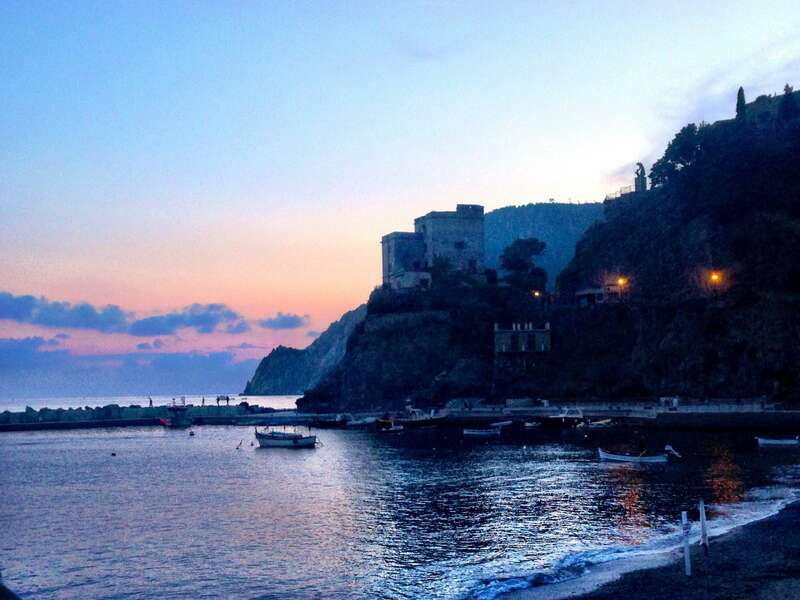 Check into your hotel then head through the tunnel to wander the streets of old Monterosso. The old town is made up of pedestrian cobblestone streets lined with shops and restaurants. Visit the medieval historical centre which lies on the summit of the hill of San Cristoforo. Marvel at the castle that overlooks the sea with its three round towers, the Aurora Tower which is the only surviving tower out of thirteen towers that protected the village, and take in the panoramic view from the Church of St. Francis. 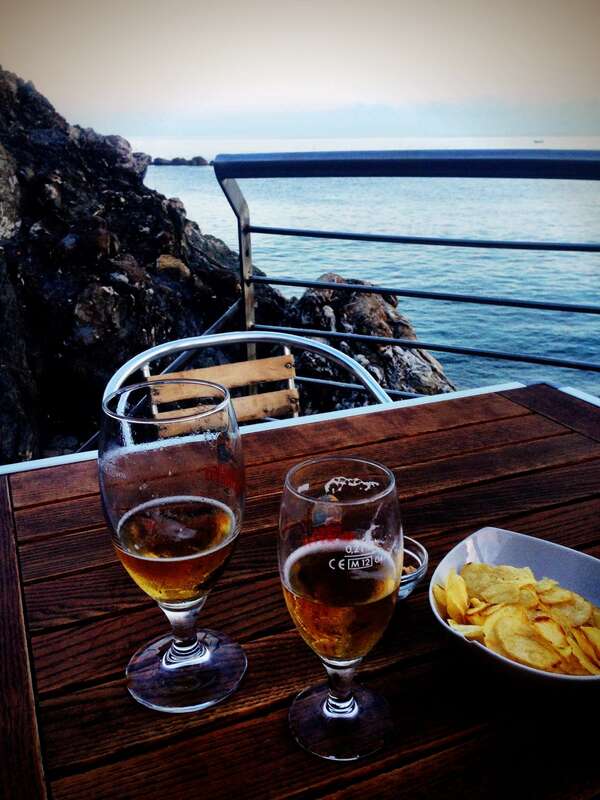 Afterwards, go to Bar Bagni Alga, a great little beach bar serving snacks with beautiful views of the sea from the patio, for a pre-dinner drink while you sit just above the beach and watch the breathtaking sunset over the water. 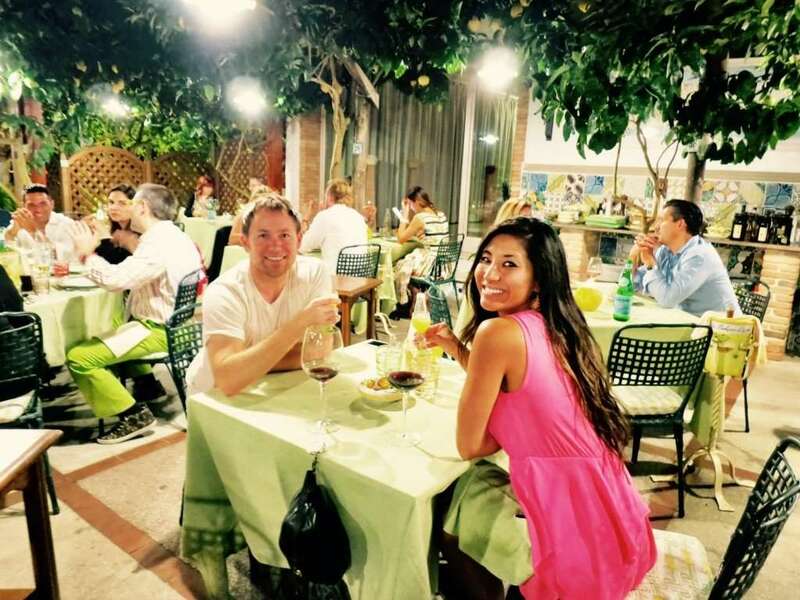 After you enjoy your sunset drinks, head to dinner at Gastronomia San Martino. This little family run cucina restaurant is off the main walkway with the most magnificent food! The menu changes every night and you order at the counter then sit at one of the 6 small tables in the restaurant. 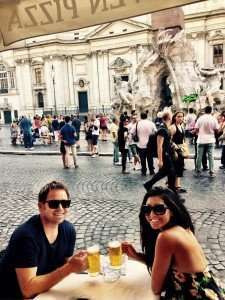 Grab a table set in the alley to people watch then head to the mellow, pub-style bars on Via Roma for an after dinner drink. 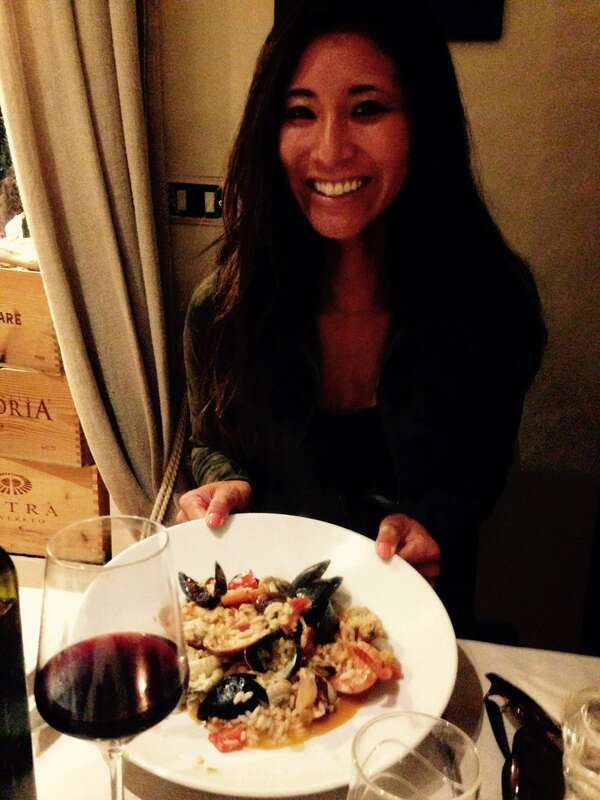 I clearly am enjoying the seafood spaghetti and the delicious bottles of wine (8 euros each). Yum! Cinque Terre is famous for its walking paths and trails. 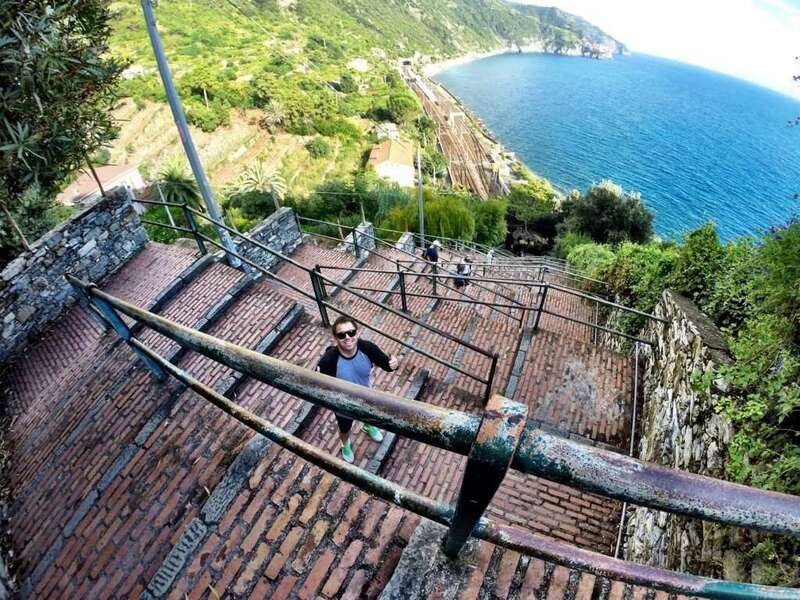 Some people hike all five villages but if you would like a taste of the hike and don’t want to commit to the 12 km hike, try the Monterosso to Vernazza trail which is 3.5 km long and takes a little under two hours. 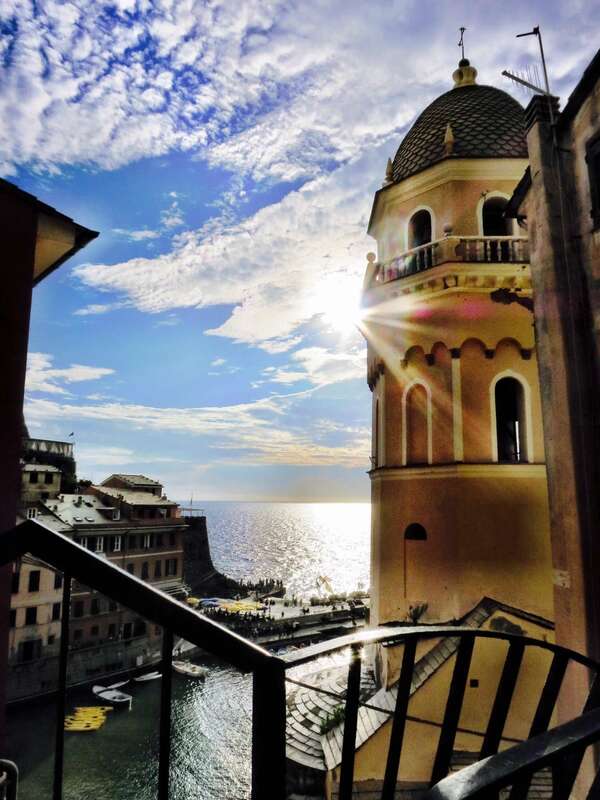 Start your journey in Monterosso al Mare after your complimentary breakfast and latte in the lobby of the La Spiaggia Hotel. 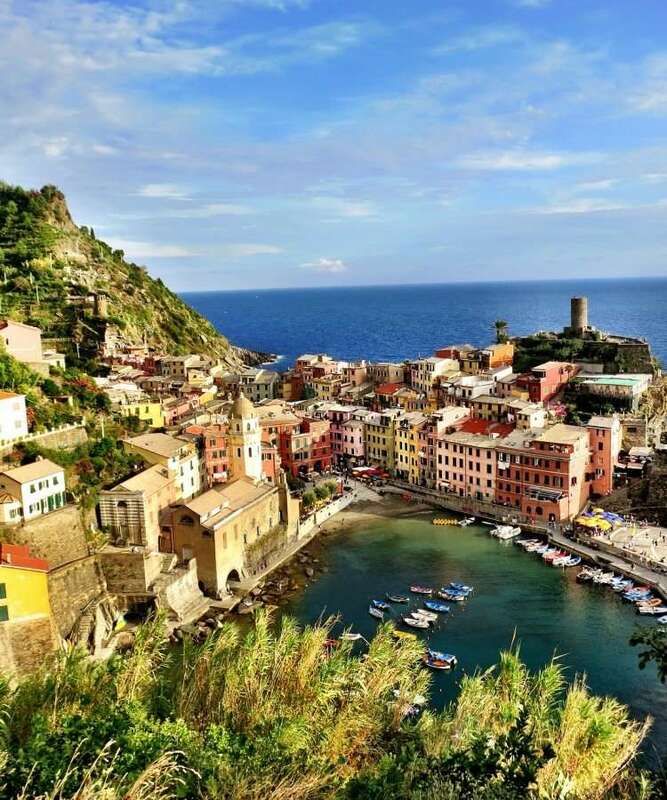 The first town you will arrive at is Vernazza, a magical one street town built on the water and situated on an impressive cliff. I find Vernazza to be the prettiest of all five villages with its beautiful harbor and cobblestoned main street. The small alleys and colorful houses give this village its beautiful charm. You’ll want to visit the church of Santa Margherita of Antiochia, a 1318 church built on sea rock with its back to the piazza and the lookout towers of the 11th-century Castello Doria with its stunning aerial views of the region (1.5 euro fee). Hike to the tree-lined square of Sanctuary of Nostra Signora di Reggio or enjoy a drink on the gorgeous waterfront piazza! You’ll then reach Corniglia, the only town in the Cinque Terre that can’t be reached from the sea and situated on a cliff 100 meters high. Climb the 365 steps up to the center of town for an amazing sweeping panoramic view of the coastline. Pass the Gothic church of San Pietro and walk through the 18th century square “Largo Taragio” (the main square of the village) with the Oratory of Santa Caterina that stands over the houses. Continue to the scenic terrace of Santa Maria to be rewarded with glorious uninterrupted views of the entire coast of the Cinque Terre. If you’d rather sunbathe than climb, discover the clothing-optional private beach of Guvano that only locals seem to know about. Head down a narrow flight of stairs above and to the right of the train platform and follow a brick coastal wall and turn right until you come to a tunnel with a metal gate. Ring the bell to the left and wait to be buzzed in. Walk down the path for 10 minutes until you arrive at a private vineyard overlooking two breathtaking beaches. Pay the gatekeeper 5 euros and enjoy paradise! You’re next village is the medieval town of Manarola, the smallest village of the Cinque Terre and the oldest! Manarola is a one street town with a small harbor for swimming with a long tradition of producing wine and olive oil which come from the hills above Manarola. This area is known for two specialty wines: Cinque Terre white, a dry, tangy blend of three different grapes and sciacchetrà, a super-sweet late-harvest dessert wine generally reserved for special occasions. Historians believe that the name from this town comes from “magna rota” meaning “big wheel” for a wheel of a water mill. You can still see the old mill that was recently restored in the lower part of the city. In the upper part of the city, you will find the Gothic church of San Lorenzo which was built in 1338 with three beautiful naves and baroque interior. Visit the white bell tower, an ancient watchtower, the ancient San Rocco Hospital and the Oratory of Disciplinati della Santissima Annunziata that dates around 1400. Manarola is one of the most picturesque villages with its brightly colored tower-houses and steep, narrow alleyways leading to the sea. Your last and final village is Riomaggiore with its one main street, a harbor, rocky beach, castle, church, pharmacy and a dozen restaurants. The houses on Riomaggiore have two entries: one at level of one street and the other at the level of the upper street. The houses were built this way in 1500 when a quick escape route was necessary in case of Saracenic raids. Take in the panoramic view from Castello sul colle di Cerricò and visit the church of San St. Lawrence with its 14th century bell tower behind it that was once used as a watchtower. The Via dell’Amore (“Lovers Lane”) is a wonderful paved and flat path carved into the mountain that begins in Riomaggiore and ends in Manarola that takes you on a relatively easy 30 minute walk along the water and rock and provides inspiring views and romantic nooks. The Via dell’Amore is also the first segment of the Sentiero Azzurro or the Blue Trail, a five-hour and somewhat challenging hiking trail that connects all five villages (5 euros for a daily pass). 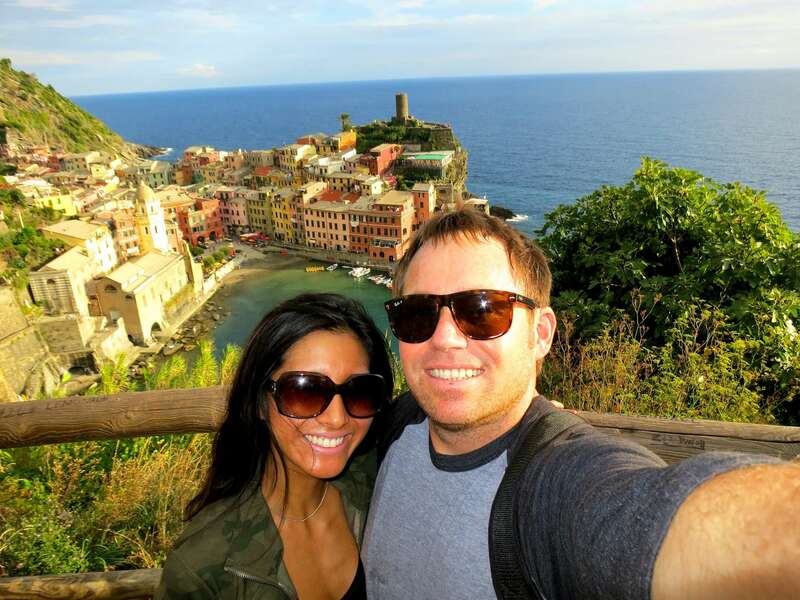 Take the Cinque Terre train back to Monterosso. Rest and clean-up for the best meal you will experience in Italy. Michelin recommended Ristorante Miky is hands down one of the best restaurants in the Cinque Terre. Their ingredients are top notch, as is their menu, presentation and service. 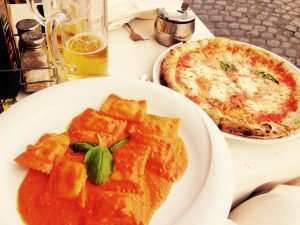 What makes their dishes stand out is that they serve most of their main courses baked in pizza dough so that the flavors steam and meld inside until it’s time to eat the delicious pizza crust! Make a reservation for a table on the outside patio and enjoy the view of the ocean with a good Borolo or Barberresco wine. The restaurant is closed on Tuesday nights. Make sure you make a reservation in advance, when we arrived for our reservation they were turning away EVERYONE without a reservation. You cannot go wrong with the seafood risotto and ravioli! Take the morning to sleep in as you’re most likely exhausted from your day of walking! You’ll want to stop in at Nuovo Bar Eden for a cappuccino or a snack. 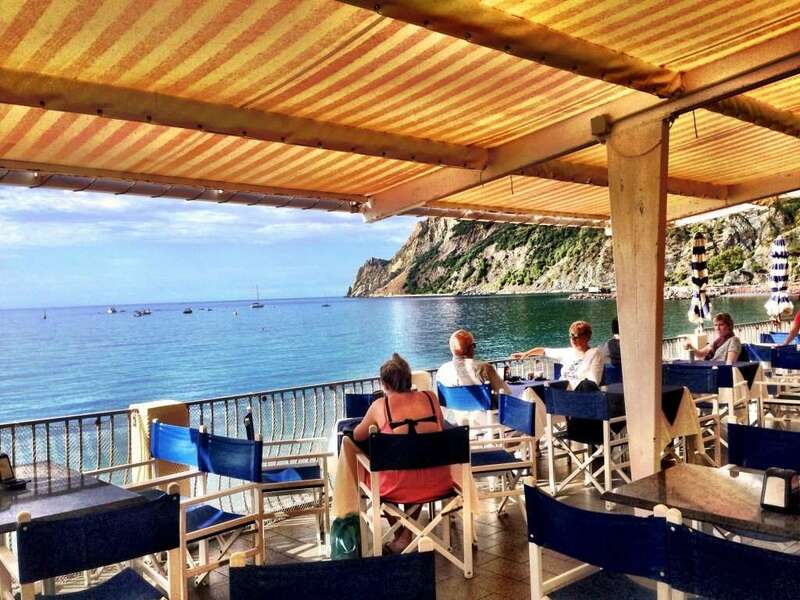 Nuovo Bar is perfectly located above the golden sand in the new part of Monterosso with a terrace that feels like you are sitting right on top of the water. The prices are great and they serve a variety of dishes from snacks to substantial meals. The service is wonderful and you can’t beat the free Wi-Fi that they offer to catch up on e-mails or current events! 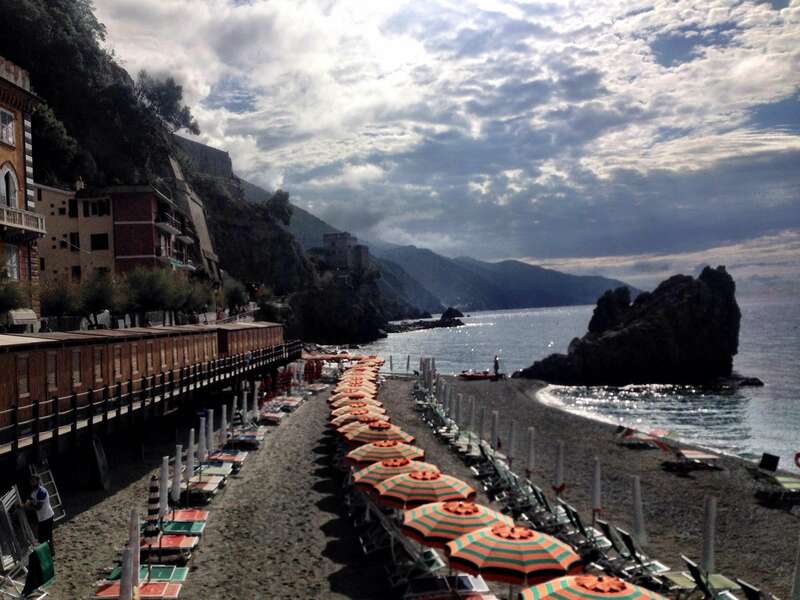 Head to the beach for the remainder of the afternoon and enjoy your last few hours in the Cinque Terre. You can rent a beach chair with an umbrella for an hourly fee at the Bagni Eden beach club or take advantage of the free beach (albeit pebbly). Find a sunny rock from which to read or write or just stare at the sea and take in the beauty! If you have room for a last meal, have lunch at one of the three tables overlooking the sea at L’Ancora della Tortuga, a new restaurant housed in a converted bunker that was used during World War II. The kitchen specializes in fish and houses spectacular views from its location on a cliff. Simply divine! Bring mosquito repellent if you are planning to walk on the trails! Book hotel reservations and train tickets in advance as they tend to sell out especially during high season. Take a day trip to Portovenere on the ferry if you have the time! Liguria is the birthplace of pesto, try a pesto pasta! The house wine in Italy is amazing! Simply ask for red or white wine. Try a glass of the Sciacchetrà, the local sweet wine, with a biscotto cookie for dipping. Once the world’s artistic and cultural center and one of the major centers of the Italian Renaissance and as well as the birthplace of the Baroque style, Rome continues to be a city filled with enchantment and romance with its ancient Roman sites, medieval and Renaissance buildings and fountains, amazing museums and bustling beautiful squares. While Rome is indeed a large city, its historic center is concentrated, making it easy to walk and explore. Rome has a Mediterranean climate with hot, dry summers and cool, humid winters with the coldest months being December, January and February. The best time to visit is from October to April where you won’t be lost in the crowds of tourists but can most likely score good deals on hotel rates. Avoid the peak season of June to August if at all possible with the crazy crowds and hot and humid weather with averages in the upper 80s (hotel reservations are recommended 6 months in advance during this time). May and September are respectively the calm before the storm and the aftermath of the storm, with temperate climate and more manageable crowds. While you probably won’t find killer deals during this time, you’ll at least find availability. We visited Rome in early September and the weather was perfect and the city was busy but not overwhelmingly full. Alitalia now has seasonal non-stop flights from Los Angeles to Rome from May through mid-November so we definitely took advantage of that. 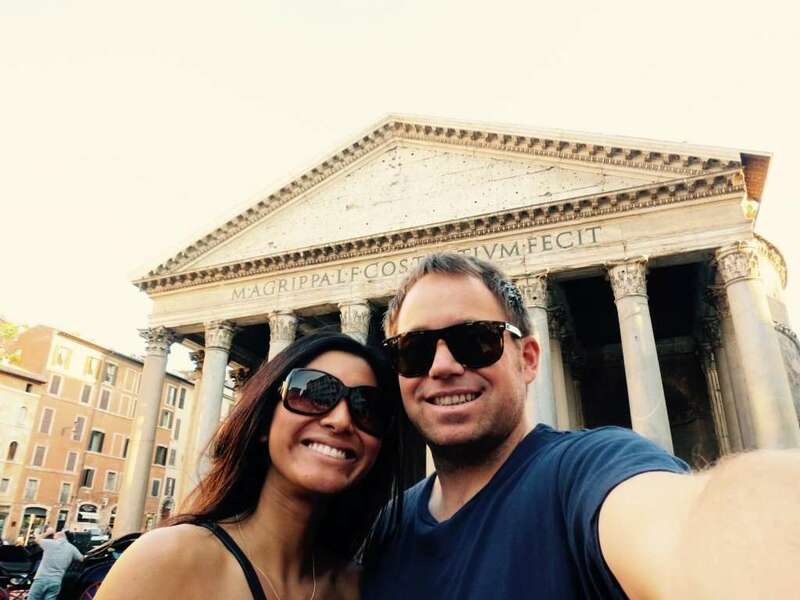 Step on the plane at LAX and 12 wine, movie and Italian olive oil cracker biscuit filled hours later you step off the plane in the Eternal City. We took the early evening Alitalia flight and landed in Rome a little after 1pm. We grabbed a shared shuttle for the 15 minute ride to our hotel which is probably the most cost effective option without having to take public transportation for the 25 mile ride to the city center. If you have the time and energy for public transportation, you can purchase a €14 ticket for the Leonardo Express train and take the 30 minute ride to Roma Termini, the main railway station of the city. A taxi will run you around €48. We were one of the first people off the shuttle so we didn’t have to go too far out of our way. We got the driver’s business card so we could arrange a pick up for our ride back to the airport and he dropped us off right in the Piazza Navona, steps from our hotel. We stayed in one of the annex rooms at Antica Dimora Della Cinque Lune and the rooms were small (in true European fashion) yet comfortable with baroque décor and tapestry. Besides the excellent location, the highlight is the complimentary rooftop view breakfast that they serve in the main building in the mornings. 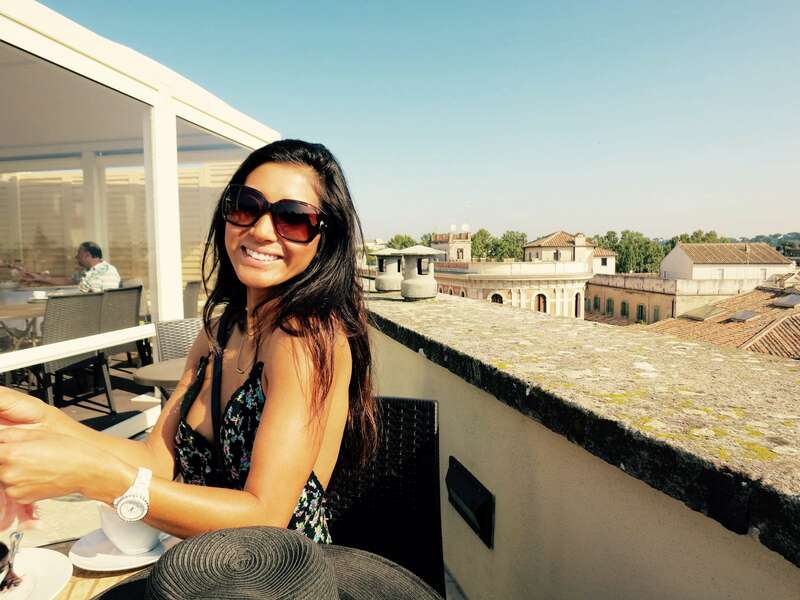 I adored waking up with my cappuccino and Nutella toast while overlooking the waking city. In general, the best areas to stay while visiting Rome as a tourist are the Piazza Navona, Campo de’ Fiori, Pantheon areas that are lively and the center of old Rome. You can’t go wrong staying in the half-mile stretch between Piazza Navona and Piazza Barberini. 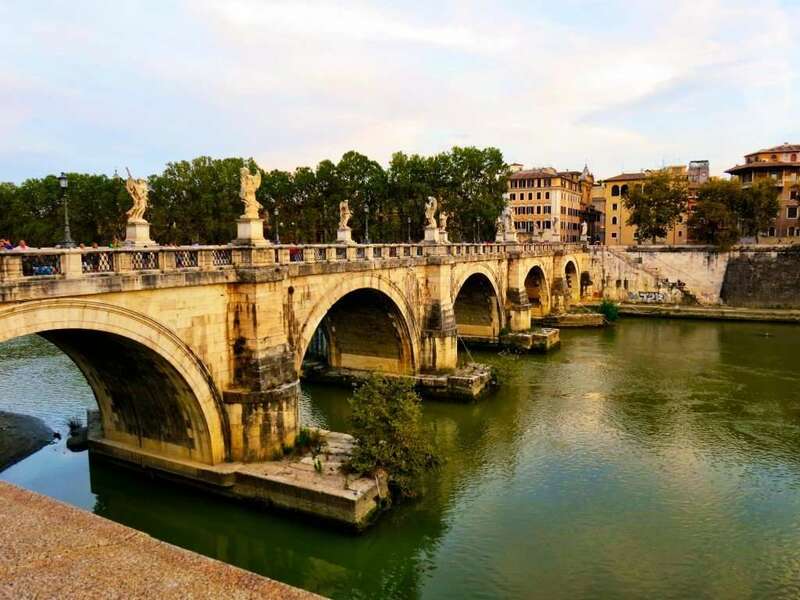 If you enjoy walking, look into staying the Trastevere area across the Tiber River (via pedestrian bridge from Campo de’ Fiori) that has more of a neighborhood feel with great restaurants, piazzas, churches, museums and shops. The Vatican area is quieter in the evenings if you prefer a slower pace neighborhood. Hotels near Stazione Termini and the train station may be cheaper and near public transportation to see all of the sights (15-20 minutes to the Forum/Colosseum). 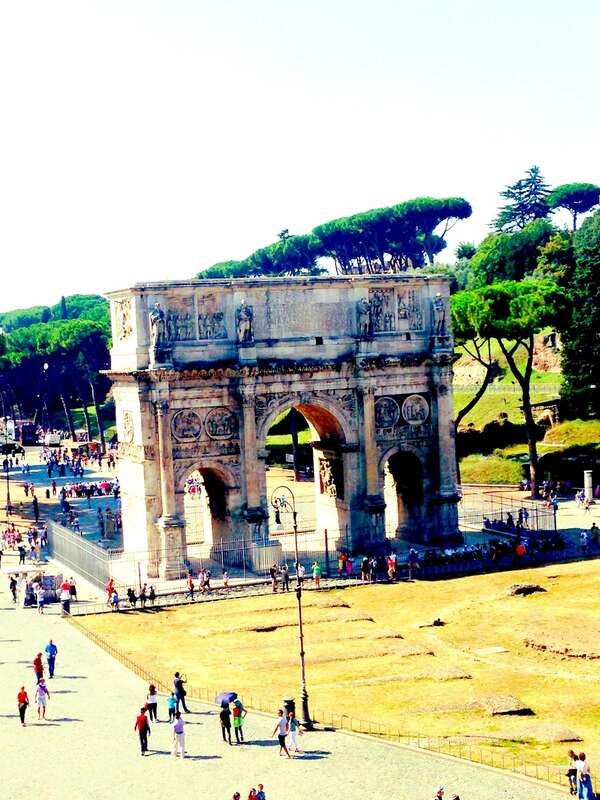 After settling into your hotel, put on your walking shoes and get ready to be immersed into Roman culture. Begin your tour at the Spanish Steps off the Spagna metro stop, the longest and widest staircase in all of Europe. Admire the Barcaccia fountain that bubbles at the foot of the steps with the Trinità dei Monti church stands tall at the top of the steps. Take a seat on one of the middle steps and take in the hustle and bustle of the city with its elaborate Roman homes and people hurrying in and out of the shops and cafes. 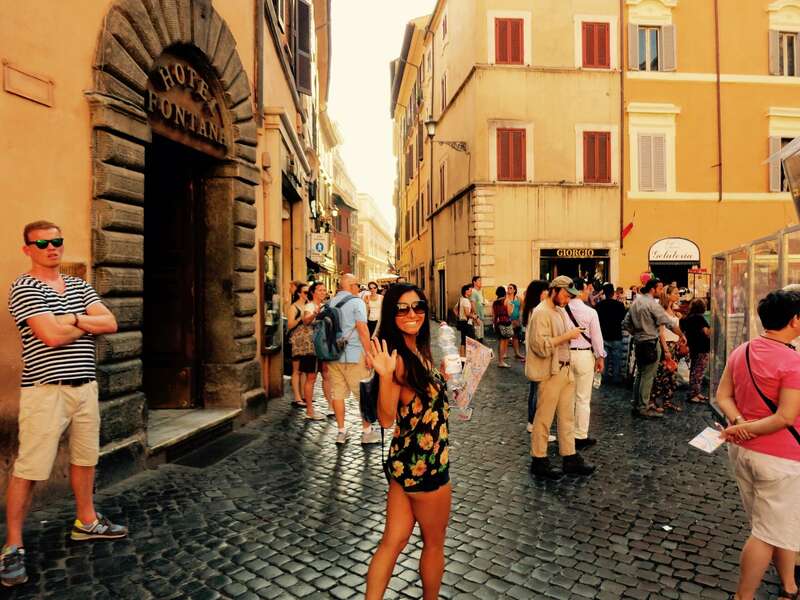 You’ll find designer shopping just west of the Piazza di Spagna at Via dei Condotti. Head to the Trevi Fountain, the famous Baroque masterpiece displaying the god Neptune riding in a shell-shaped chariot led by seahorses. Legend has it that throwing one, two or three coins into the fountain (with your right hand over your left shoulder) ensures that 1) you’ll return to Rome 2) you’ll fall in love with a Roman and 3) you’ll marry that Roman. Not to worry, the money collected from the fountain is used for a good cause to support food programs for the city’s poor. 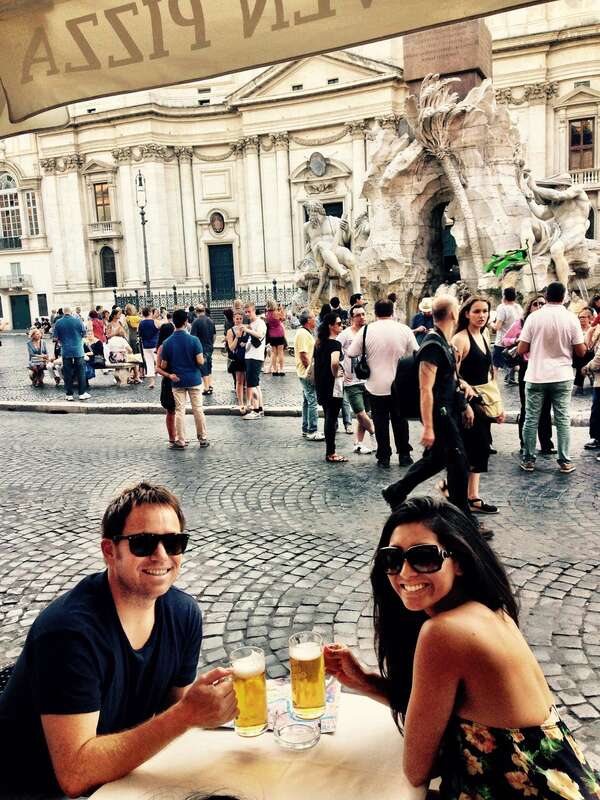 The Trevi Fountain is off the Barberini and Spagna metro stop, located in Corso and Spagna. The fountain was under construction when we made our wishes but we got the basic idea! After you marvel at the fountain, try the best gelato in Rome at Il Gelato di San Crispino a few blocks from the Trevi Fountain. As you walk through the streets of Rome, you’ll be pleased when you arrive at the bustling cafes and gelato shops of the Piazza della Rotunda and suddenly look up and see the breathtaking Pantheon, one of my favorite buildings in Rome. Originally Rome’s temple to the gods with its marvelous oculus, a 27-foot hole in the center of the rotunda, the Pantheon was eventually also a designated tomb for the city’s artists and elite including Raphael the painter and former kings of Italy. First constructed in 27 B.C. and later rebuilt in the early 2nd century, the Pantheon is an architectural marvel and, of course, a definite selfie spot! The Pantheon is open daily with abbreviated hours on Sunday and located in the Navona and Campo corner of Rome off the Barberini metro stop. Make your way to Campo de’ Fiori market and take in all of the fruit and vegetable stands, butchers and bakers. Pizza by the slice at one of the many bakeries or “fornos” that line the periphery, along with the cafés and gelaterias, always makes for the perfect snack! The best time to visit the market is in the morning from 7am to 1pm. The tourist stands take over on Sunday, so any other day of the week is ideal. Boasting fresh vegetables and fruits during the day, Campo de’ Fiori harbors quite the nightlife and hopping bar scene at night. From the market, stroll to Piazza Navona for a drink to listen to the street performers, people watch and marvel at its 3 fountains, the largest and most well-known being Bernini’s beautiful Four Rivers Fountain, with 4 statues representing the world’s major rivers of the known continents in the 17th century. Once the site of sporting events at Domitian’s stadium in A.D.89, it’s no surprise that this is Rome’s loveliest public square. If you are an art buff or Caravaggio fan, you will want to visit the Church of San Luigi dei Francesi, a French church with three Caravaggio paintings each depicting a scene from the life of St. Mattthew. Closed for lunch each day and all day Wednesday, you’ll find this church in the Navona neighborhood and a 15-minute walk from the Barberini metro stop. 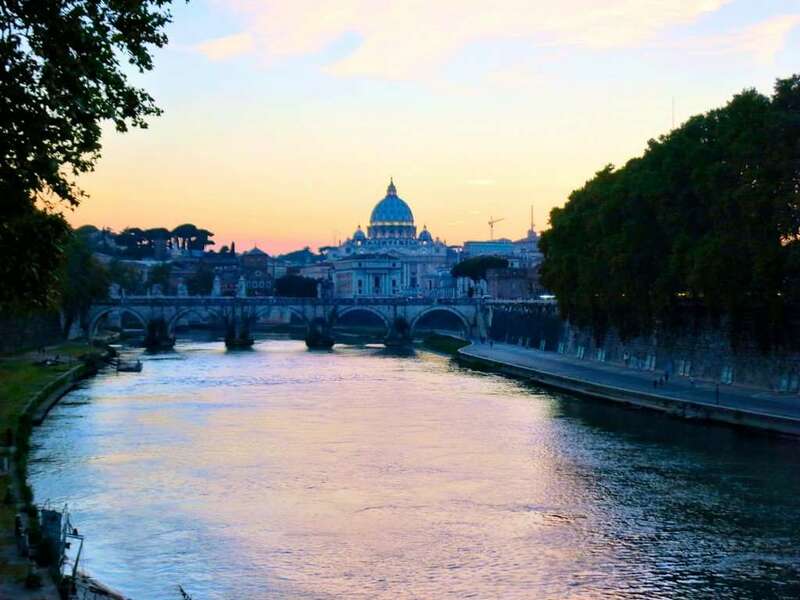 As the sun begins to set, you’ll be able to see the fortress on the Tiber River, the Castel Saint Angelo, by walking just a few minutes past the Piazza Navona. What began as Emperor Hadrian’s design for his tomb now houses dungeons, tombs, papal chambers, canons, armor, and an angel. There are often concerts on the terraces in the summer and an ice skating rink outside in the winter. Take a walk along the river and you’ll be able to enjoy a view of the Vatican from the bridge which is quite spectacular. BYOSS (bring your own selfie stick) if you don’t want to be hassled by the vendors renting theirs! Relax and prepare to head to dinner in Trastevere, a bohemian neighborhood located south of Vatican City with the name literally meaning “across the Tiber” that portrays a much more authentic look at life as a Roman. You’ll find a plethora of neighborhood restaurants, affordable shops, dance clubs, sidewalk vendors, and pubs. 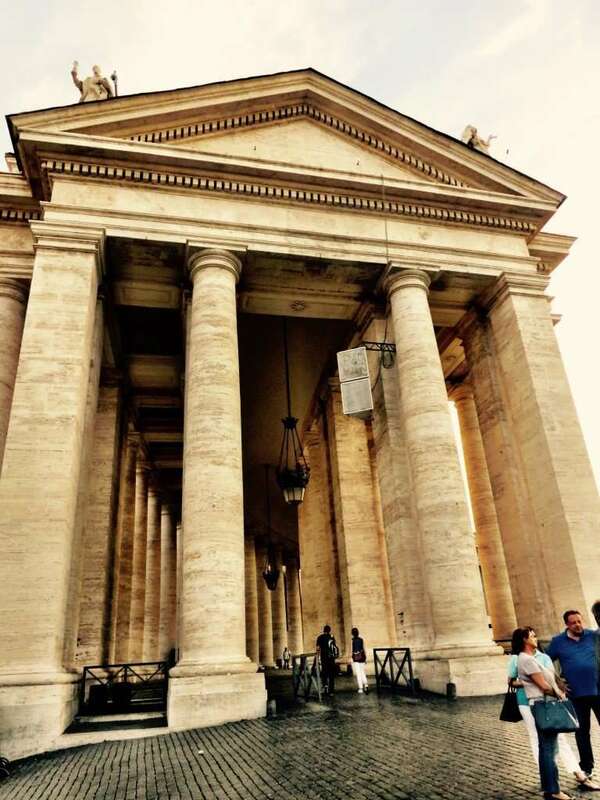 Wander into Santa Maria church, one of the oldest churches in Rome, and one of the most majestic! You will not be disappointed dining at Da Enzo, the most genuine Roman trattoria that has the highest quality ingredients with all of their meat, eggs, cheese and wine being 100% organic, all produce coming from nearby farms, and serving lovely olive oil from north Lazario. The trattoria is located in the most peaceful part of eastern Trastevere and is cherished by locals. Revel in the Burrata d’Andria (fresh from Puglia) and their legendary carbonara then enjoy a post-dinner stroll around the neighborhood! Begin your day of sightseeing at the Colosseum, one of the great engineering wonders of the ancient world. Imagine yourself as one of the 50,000 or more spectators watching one of the bloody gladiator fights that first began in A.D. 82. Make sure your purchase your entrance tickets online or at either the Palatine or Forum ahead of time or you’ll be waiting in line for quite some time. Your ticket is good for 2 consecutive days and includes admission to Palatine Hill and the Forum. The Colosseum is open daily from morning until about an hour before sunset and is off the Colosseo metro stop. After exiting the Colosseum, walk past the Via Sacra and Arch of Constantine, built in 315 to commemorate the victory of Constantine over Marcus Aurelius Valerius Maxentius. Climb to the top of Palatine Hill for sweeping views of the city. Palatine Hill was the legendary home of Romulus. 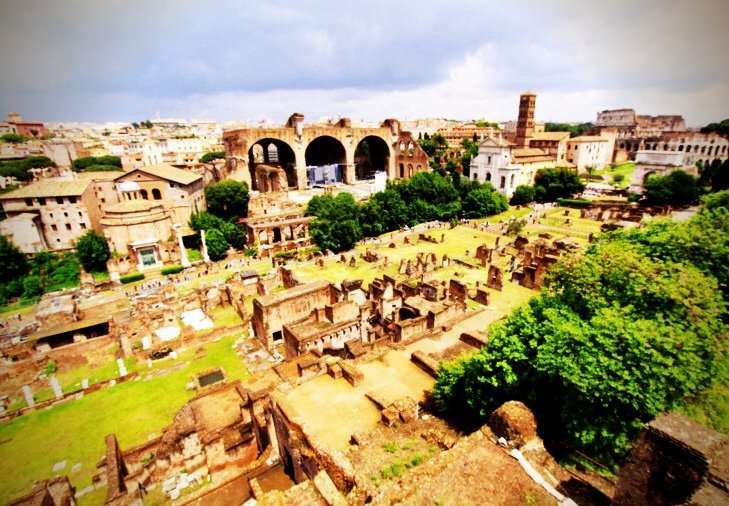 Here you’ll see grand ruins and enjoy views over the Circus Maximus, the Aventine Hall and the Forum. You’ll walk past remains of the senate, courts, triumphal arches, and temples to the gods. 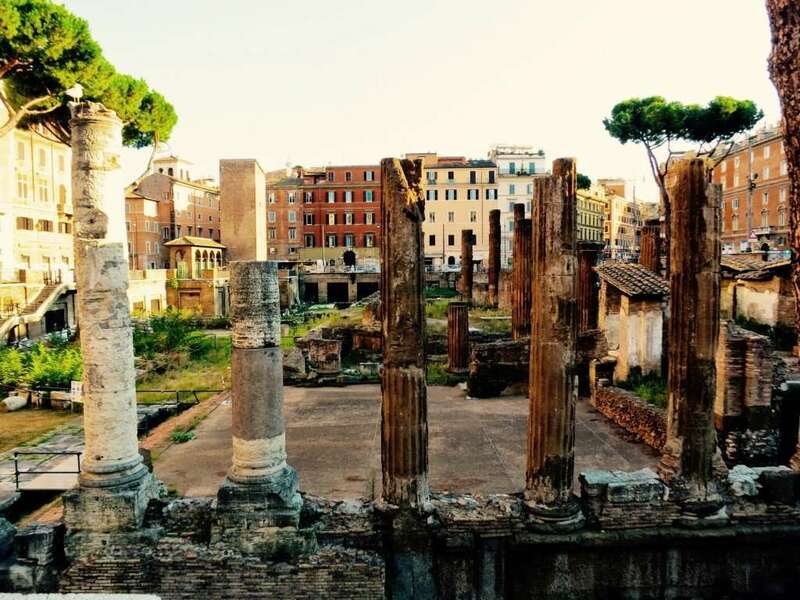 Finally make your way to the Roman Forum, the center of city life in ancient Rome, and center for festivals, celebrations, funerals and rituals. The once grassy area fell to waste around the 8th century then provided grounds for excavations in the early 20th century. Although much of the complex is now in ruins, you can see the remains and imagine the glory of the former temples and arches. The Forum is open daily from 8:30 am to 4:00 pm and is free. Take a taxi to the Galleria Borghese and stop at a local market or pizzeria on the way for a relaxing picnic in the beautiful and sprawling gardens at Villa Borghese. The museum only admits 360 visitors every 2 hours so make sure you make your reservations in advance. Once inside the museum, you’ll find the Apollo and Daphne sculptures by Bernini as well as his take on young David preparing to take on Goliath. You’ll also find works by master artists Correggio, Raphael, Rubens and Caravaggio. On your way back towards the center of town, stop in at the Capuchin Crypt located under Our Lady of the Conception of the Capuchins. It is absolutely fascinating to see the displays of bones and skulls of the deceased that the friars arranged into displays and frames for Christian artwork throughout the crypt. These masterpieces tell the story of life, death and resurrection and demonstrate a unique interpretation of the church’s teachings of good, evil and eternity. 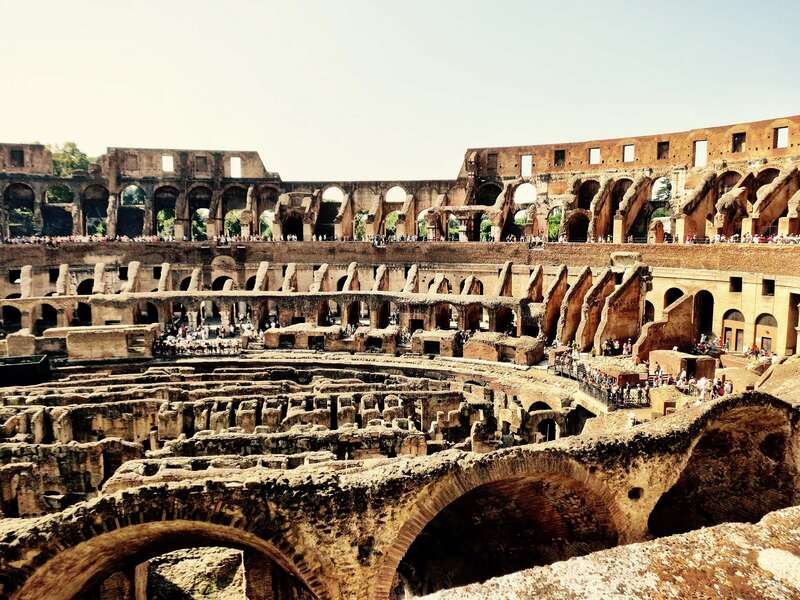 Alternatively, purchase a €6 ticket and stop at the Catacombs of San Callisto, the official cemetery for the Christians of Rome and burial place of third-century popes. One of the 40 or so known catacombs scattered outside Rome’s ancient walls, the tomb-lined tunnels are rich in early Christian symbolism which functioned as a secret language. In ancient Roman times, no one was allowed to be buried within the walls of the city and Christians buried deep to get more mileage out of the land donated by a few wealthy Christians and to be near martyrs and saints already buried there. You deserve a nice meal at this point and you will not be disappointed dining at either Armando al Pantheon (closed Saturday night and Sunday) or Ristorante Roof Garden Hotel Forum. Armando al Pantheon is an exquisite family owned restaurant less than half a block from the Pantheon but don’t let its proximity to the Pantheon make you skeptical that this is a tourist trap…this restaurant is the real deal. The Gargioli family serves the most genuine seasonal Roman specialties using the highest quality ingredients. Chef Claudio Gargioli is known for dishes ranging from simple spaghetti aglio, olio, e pepperoncino (pasta with garlic, oil and chili) and gnocchi with gorgonzola sauce to the more complex spaghetti alla gricia (pasta with cured pork jowl, black pepper and pecorino romano cheese). This restaurant is rather small and books up far in advance so make your reservations early! You can also enjoy divine Italian and international food over sweeping panorama views over the Forum and the Colosseum at the Ristorante Roof Garden Hotel Forum for dinner (or lunch). The menu changes every day with specialties including risotto with langoustine sauce and tartar of Carloforte tuna, from an island off Sardina, served with a delicate avocado sauce. 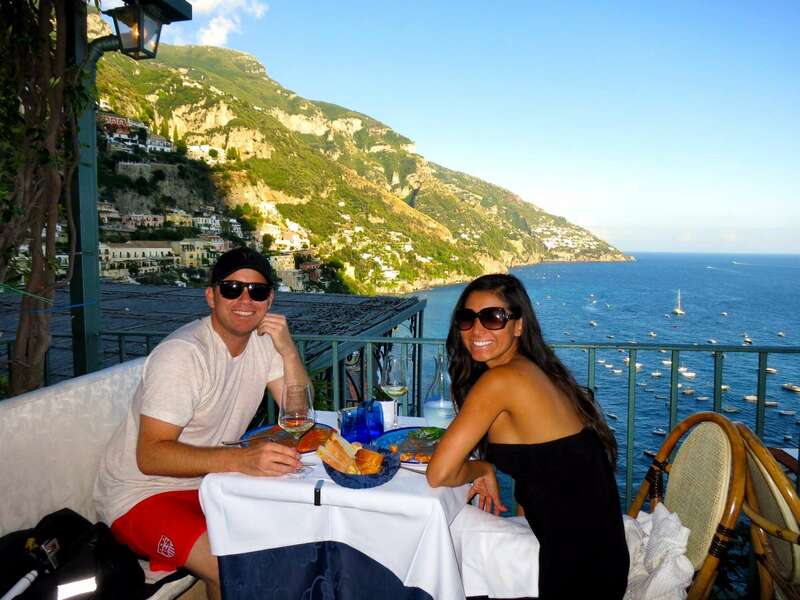 The food here is absolutely incredible and the views are breathtaking! There is nothing quite like seeing Rome at night. If you can still walk, stroll off your dinner starting at the far side of the hill on Via dei Fiori Imperiali and marvel at the glow of the Colosseum and the haunting yet enchanting ruins of the Forum. Walk down Michelangelo’s steps and see the mini-Colosseum of the Theater of Marcellus across the street and the ruins of the Octavian Gate to the right. Beyond the ruins on Via del Portico d’Ottavia, the Jewish Ghetto still thrives with their shops buzzing at night. Nearby is the Piazza Mattei with its statue of four bronze boys playing in the Fountain of Turtles and Largo Argentina where the columns of the Republican Vicotry Temples, more than 2,000 years old, stand tall. It was here, and not at the Forum as commonly perceived, where Julius Caesar was killed on March 15, 44 B.C. Have a cappuccino or drink as you watch the crowds of Italians stroll and shop at Piazza del Popo, Piazza Campo dei Fiori and the famous steps of Piazza di Spagna that are packed with people day and night. Although located in Rome, Vatican City has been an independent state since 1929 with its own flag, coin, stamps and even its own militia, the Swiss Guard. 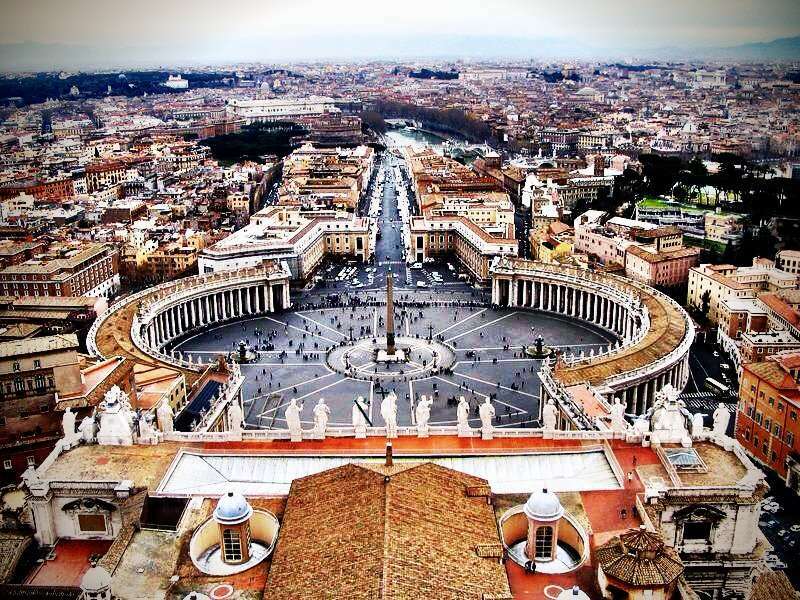 Vatican City is the seat of the Catholic religion and has been the home of the Pope since 1937. Spend your Sunday in this magically beautiful and holy micro-nation. The best way to walk to Vatican City is over the Ponte St. Angelo bridge, past Castel St. Angelo. You can find the museums off the Cipro-Musei Vaticani metro stop. You’ll enter Vatican City through breathtaking St. Peter’s Square. You can receive a blessing from the Pope but you’ll need to arrive in the square well before his noon appearance on Sunday. Free tickets are also available for papal addresses on Wednesdays at 11 am September through June at www.vatican.va. Fax the form to +39 (0)6 6988 5863 and pick up your tickets under Bernini’s colonnade to the right of St. Peter’s. 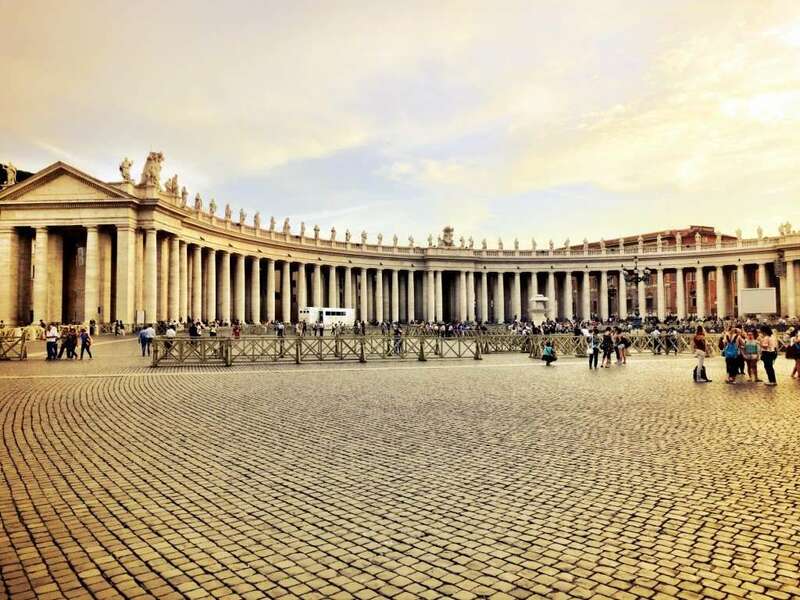 Visit the Vatican Museums, the largest museum complex in the world with over 1400 rooms and 1.2 miles of classical art treasures from ancient Greece to the Renaissance. The Vatican Museums include the museum, galleries with 3,000 years of art, the Sistine Chapel, and part of the papal palace. Tickets cost €16 for adults and €8 for children ages 6 to 18 and can be purchased at http://mv.vatican.va/. Make sure you bring a printout of advance reservations ahead of time or you will be waiting in the entrance line all day. They are closed Sundays and holidays except the last Sunday of the month when they are free. One of the world’s greatest masterpieces and built from 1473-1481, the Sistine Chapel is a must-see with its Michelangelo’s Seven Days of Creation ceiling fresco and Universal Judgment entrance wall. You’ll find beautiful biblical scenes on the walls that were created by several famous artists including Perugino and Botticelli. Guided tours are highly recommended with audio-guides being the most affordable option. 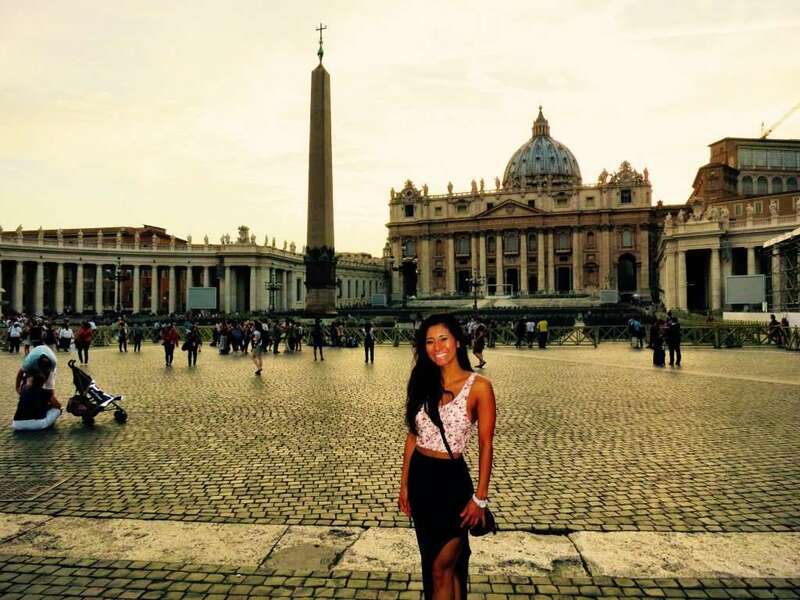 St. Peter’s Basilica is a major destination for religious pilgrims and is one of the world’s largest and most important of the Roman Catholic churches. Don’t miss Michelangelo’s stunning and tragic Pietà, his unfinished sculpture of the grieving Madonna cradling her lost son. Advanced reservations to see the Tomb of St. Peter can also be arranged for visitors age 15+ (€10 each) by e-mailing the Excavations Office at [email protected]. Entrance to the church is free but make sure you are dressed appropriately with no bare shoulders or shorts/skirts above the knee! St. Peter’s Basilica is open daily from 7 am to 7 pm (until 6 pm in October – March) and closed on Wednesday mornings for pope appearances. Masses are held in Italian all day on Sundays. Begin the summit to the top of St. Peter’s dome via a side door to the right of the Basilica. You can climb all 551 steps or take the elevator then climb the remaining 320 steps. The climb takes approximately 1 hour but the panorama views of Rome’s hills awash in rose-gold light is more than worth it! Have lunch and the best panini in town (and possibly in all of Europe) at Panino Divino after your long morning tour. Panino Divino is approximately a 5 minute walk from Vatican city and is adored for its taste, location, value and friendly service by the owners. For 5 euros, you can get a soda and a panini…try one with chili jam! The Metro runs frequently but doesn’t serve much of this historic center so you’re better off exploring this area on foot. Wear comfortable walking shoes! The Roma Pass is valid for 48 or 72 hours and allows unlimited transportation in the city, plus discounts at various sights, shops and restaurants. Visit the Vatican Museums and the Musei Capitolini for free if you plan your trip over the last Sunday of the month. A bar or café usually has a lower price for items consumed standing at the bar versus seated at a table. Apparently it is safe to drink from any fountain in the city…proceed with caution.